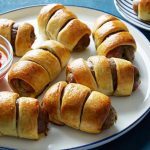 Making these fathead pigs in a blanket is a must for home parties! Tender and tasty dough wrapped around juicy grass-fed beef hot dogs. These are low carb and keto diet friendly.